Play if… you’ve ever thought that our 2016 election had some, um, hidden agendas. Avoid if… you hide political posts on your Facebook or Twitter feeds. Description (from the company website): Not available on their website at the time of posting. Description of the room: It is shortly after the election and you are back in now candidate (Senator) O’Conner’s office. The room is essentially the same office you may have seen on previous occasions/episodes. Understanding of the Mission: You have to search through the room to piece together what happened just prior to the election and what happened on Election Day. Find out who may have rigged the election (by taking money from foreign agents), which States committed voter fraud, and who the REAL President is! Our Suggested Party Size: We had 6 this time, which was perfect. 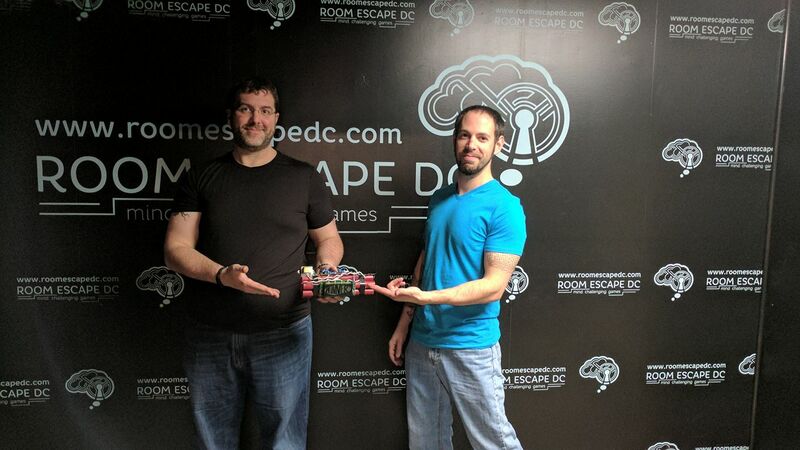 Team Disturbed Friends (Steph, Jason, Eric, Mike, Steph, and Heather) took first place on the leaderboard and solved the room within 45 minutes! Pawns ARE the Weakest Piece in the Game – Room: House of Pawns, Episode 3 – January 28, 2018 – PLAY TESTED – FAILED! Play if… you ever had a fantasy of being a burglar in the Watergate scandal, or a private investigator ransacking an office. Avoid if… you get anxious just walking into someone’s vacant office, let alone having to search their desk for a pen in the fear that someone walks in on you while you’re doing so. Description (from the company website): Esteemed scientist Kumar is dead, and “foul play” is on everyone’s lips. With the Asteroid Bill past the Senate floor, and the Concorde project on schedule, the plot is thickening fast. Your duty as an oil lobbyist to identify who axed Kumar and why. Was it Frederick O’Connor in a rage of jealousy? After all, Kumar was reportedly having an affair with O’Connor’s wife. Could it have been Mrs. O’Connor herself, a politically ambitious woman who would rather not have had her Kumar antics revealed? Or perhaps someone else altogether with an ulterior motive unbeknown. All the evidence you need is in Frederick O’Connor’s office. The clock is ticking and you must figure out the plot before the time runs out. Description of the room: You’re now an oil lobbyist who has infiltrated Senator O’Conner’s office, looking for proof of who killed the scientist (Kumar) in an effort to kill the Asteroid Bill that has passed the Senate (the bill, from Episode 2, would advance alternative energy from the element discovered on the asteroid, using the formula that Kumar developed to turn it into efficient energy). Lots of intrigue here. Understanding of the Mission: Find out who killed Kumar, and the role of the conspirators. Our Suggested Party Size: We only had 3, and that wasn’t enough. We recommend 5-8. Worth the time and money? Yes, however we think not knowing the story may make most of the puzzles and such feel out of place. Read on to understand why. Play if… you live in DC primarily for the political scene. Avoid if… you couldn’t make it through Season 1 of House of Cards. Fossil fuel dependency may come to an end faster than expected if the Asteroid Bill passes, but not everyone is happy about the prospect of this game-changer. Sen. Frederick O’Connor’s college buddy may have found a way to convert one of the asteroid’s natural elements into abundant fuel. Can you, as a lobbyist for the alternative energy jetsetters, find the element and the formula to secure your freedom from the room? Do not expect the key to be out in the open. It is hidden among clues everywhere you look. Your objective is to sift through all the chaff to get to the wheat — fast! You will have no time to waste flapping your gums when the world’s energy crisis could be moments from an astounding conclusion. Metro Access/Parking: Eastern Market metro stop is about 3 blocks away. If you drive, you’re going to be looking for street parking, so we recommend metro or Lyft (or rolling the dice and driving). Description of the room: You’re locked in an office and have 60 minutes to find the formula for this alternative energy spectacle. Understanding of the Mission: While locked in the office, you need to use all the clues hidden in plain sight, as well as your mental faculties (if you have any), to solve the puzzle and find the formula and element needed for this astronomically useful source of new found energy. Worth the time and money? Yes. But we missed episode 1, and we feel that we lost some of the backstory (again, however, it wasn’t a requirement to play this room, which has since been retired and replaced with Episode 3. Play if… you’ve always wanted to be a Secret Service agent. Avoid if… history just ain’t your thing. 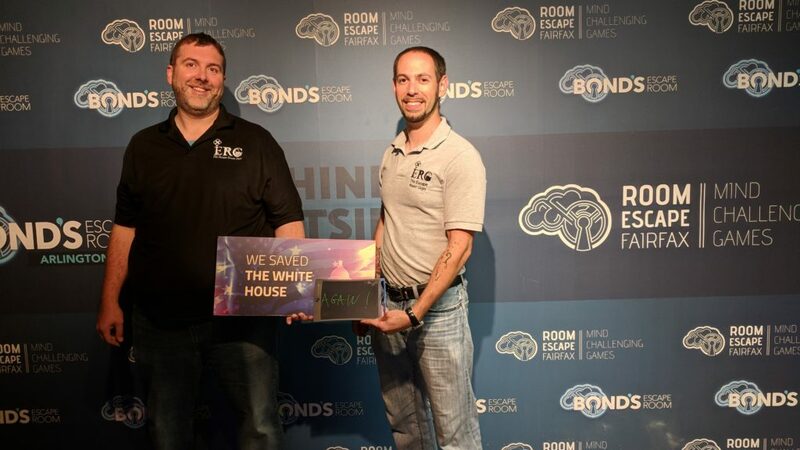 Description (from the company website): Escape the Oval Office is an escape room game where you are a team of White House correspondents for the National News Agency and you just received an anonymous tip about a brewing “scandal” in the White House. Now you and your colleagues must sneak into the Oval Office to uncover the details so that you can get your story to print in 60 minutes. Staging Area: The room is in a townhouse on the second floor, so it’s basically a living room. It is spacious with a lot of seating. Metro Access/Parking: Union Station and Galludet Metro stops are both a 1.2 mile walk away from this location, or search for street parking. Description of the room: It’s a room that is decorated to mimic the Oval Office. Desk, 2 couches, table. Understanding of the Mission: You are part of the White House press crew and get a tip that there is a scandal being covered up. Does it go all the way to the top? You need to infiltrate the Oval Office, find proof of the scandal, and escape before Secret Service catches you. Members of our team (other than the ERG): Steph, Gina, Shanell, Aaron, Jennifer and two random guys. Our first room! 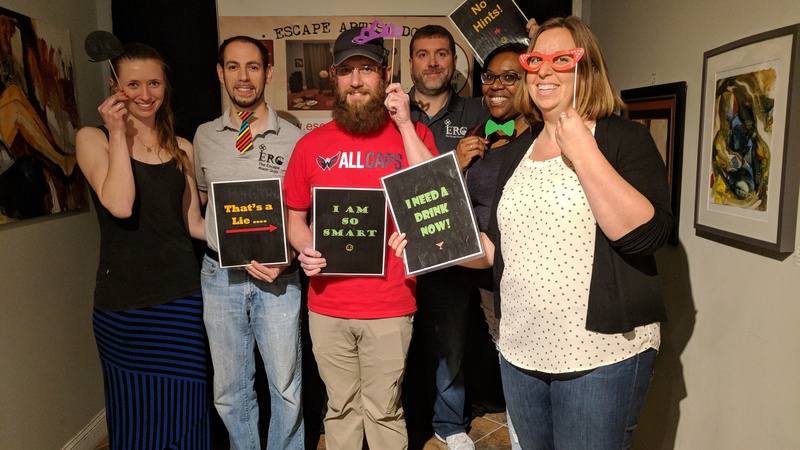 The team (Jason, Mike, Steph, Gina, Shanell, Jennifer and Aaron) escaped the Oval Office! Dangerously Delicious Pies – stop in for a slice of sweet or savory pie! Star & Shamrock Tavern & Deli – stop in for a drink and pub food.